Hepatitis B virus (HBV) infection remains a public health problem worldwide. In this review, we aim to assess the current situation of the HBV care pathway in the Kingdom of Saudi Arabia (KSA), identify gaps/barriers therein, and recommend initiatives to be taken to improve the management of such patients. Towards this end, a literature search was conducted in PubMed and free Internet searches. Interviews with individuals and focus group discussions were held with HBV experts in KSA. Although significant improvements have been made in the past 30 years in KSA in terms of the decline in prevalence (currently estimated to be around 1.3%), the morbidity and mortality related to the disease have not shown a parallel decline. This makes HBV an important public health concern. Furthermore, poor disease awareness, low diagnosis rates, and nonadherence to therapy amplify the disease burden. There are several mandated national screening structures present; however, established protocols for those who test positive and subsequent linkage-to-care are inadequate. In the absence of a virologic cure, a concerted effort should be made to provide safe and effective lifelong treatment. This review provides recommendations to reduce the HBV disease burden in the Saudi population. Background/Aim: For resectable extrahepatic cholangiocarcinoma with biliary obstruction, it remains a controversy whether to choose percutaneous transhepatic biliary drainage (PTBD) or endoscopic biliary drainage (EBD). A systematic review was conducted to compare the long-term efficacy between the two techniques. 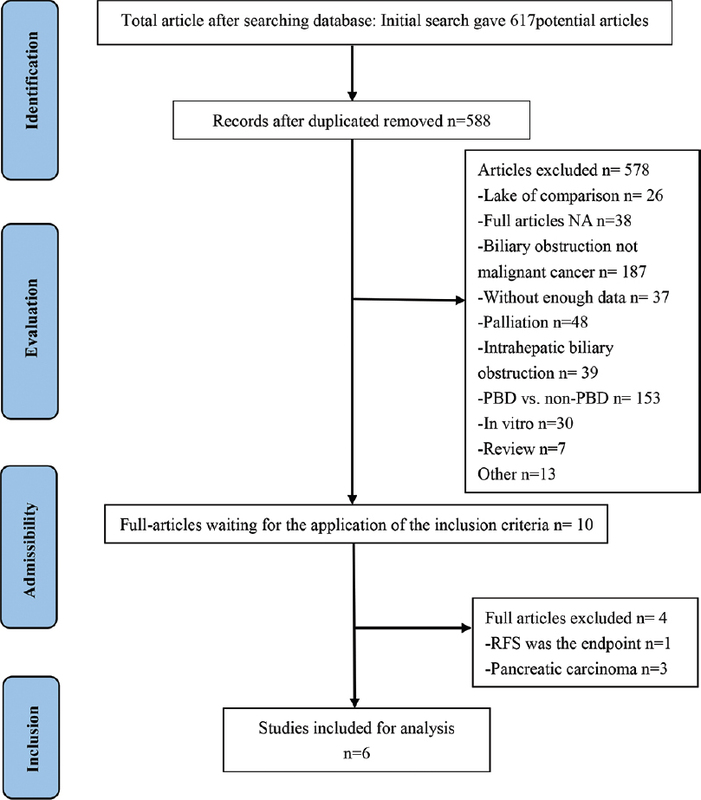 Materials and Methods: Eligible studies were searched from January 1990 to May 2018, comparing the long-term efficacy between EBD and PTBD for extrahepatic cholangiocarcinoma. Primary end point was overall survival (OS) rate, and secondary end points included postoperative severe complications and seeding metastasis. Effect size on outcomes was calculated using a fixed- or random-effect model, accompanied with hazard ratio (HR) and 95% confidence interval (CI). Result: Six studies were included in this meta-analysis. Meta-analysis showed that EBD was superior to PTBD in OS (HR = 0.70, 95% CI 0.59–0.84,P= 0.0002). But subgroup results showed that the superiority disappeared in distal cholangiocarcinoma (HR = 0.76, 95% CI 0.56–1.01,P= 0.06). Other prognostic factors such as intraoperative blood transfusion, lymphatic metastasis and seeding metastasis, were inconsistent between groups. In addition, regional disparity was obviously apparent between Japanese and non-Japanese studies. Conclusion: The conclusion that EBD was superior to PTBD in OS for resectable extrahepatic cholangiocarcinoma with biliary obstruction is less convincing, and more trials need to be conducted in future. Background/Aim: Instrument-based image-enhanced endoscopy (IEE) is of benefit in detecting and characterizing lesions during colonoscopy. We aimed to study the ability of community-based gastroenterologists to differentiate between neoplastic and non-neoplastic lesions using IEE modalities and to identify predictors of correct classification and the confidence of the optical diagnosis made. 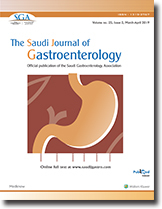 Materials and Methods: An electronic survey was sent to practicing gastroenterologists using electronic tablets during a gastroenterology meeting. Demographic and professional information was gathered and endoscopic images of various colonic lesions were shown and they were requested to classify the images based in white light, flexible spectral imaging color enhancement (FICE), iScan, and narrow band imaging (NBI). Results: Overall, 71 gastroenterologists responded to the survey, 76% were males and the majority were aged between 36 and 45 years (44%). Most of the respondents practiced both hepatology and gastroenterology (56%) and most of them had never received any training on IEE (66%). 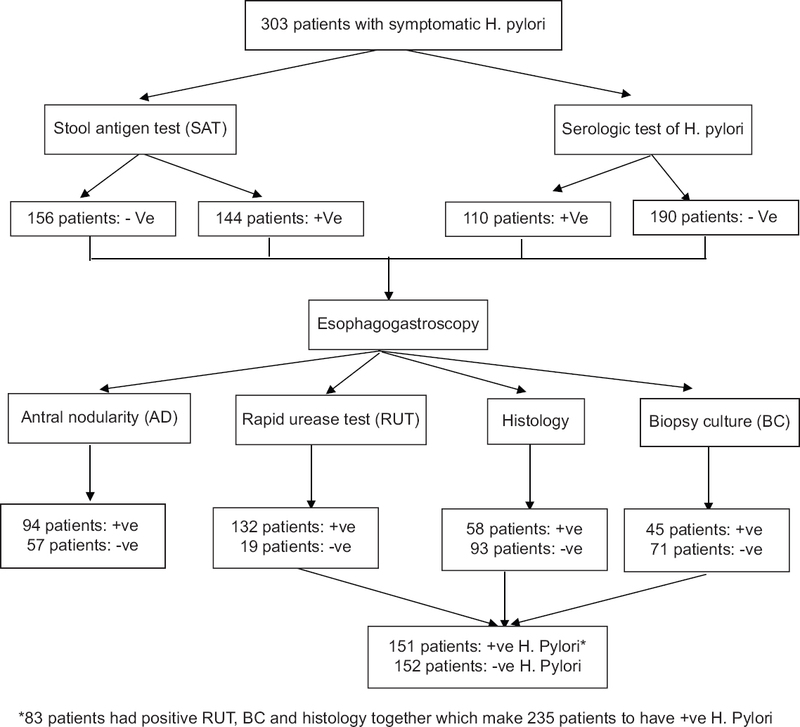 Correct identification of lesions using regular white light endoscopy was low (range 28%–84%). 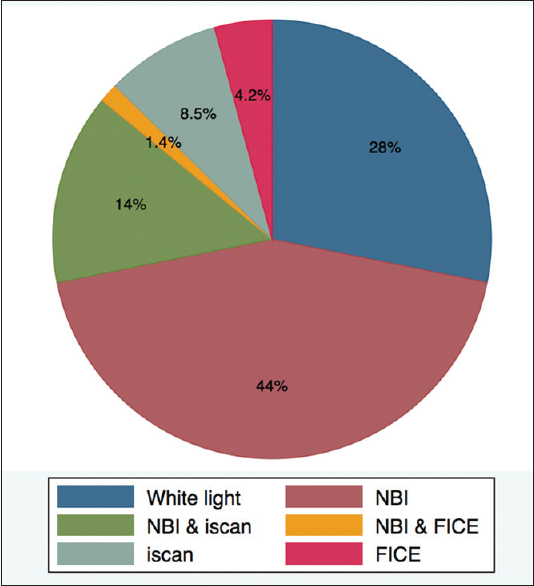 None of the IEE modalities increased the percentage of correct diagnoses apart from one NBI image where it increased from 28% (95%CI: 17%–38%) to 56% (95%CI: 44%–68%) (P < 0.01). Those who identified themselves as practicing mainly luminal gastroenterology were more confident 72% (95%CI: 60%–84%) compared with hepatologists 36% (95%CI: 25%–48%), or those who practiced both 48% (95%CI: 39%–56%) despite no difference in the percentage in correct answers. Conclusion: There remain areas of improvement in the performance of endoscopists in practice and would recommend more dedicated training programs, which could make use of asynchronous technological platforms. Background/Aim: Obesity has become a global health care problem. In Saudi Arabia, up to 75% of adults are reportedly overweight. Morbid obesity has been associated with an increased risk of many comorbidities and mortality. Bariatric surgery is currently considered the most effective treatment option for morbid obesity. However, there are many concerns regarding the short and long-term complications of weight reduction surgery. It is unclear whether the general population is adequately aware of these risks. Therefore, we aimed to assess awareness of the general population of bariatric surgery complications. Although effective, bariatric surgery has been associated with many acute complications, reported in a range of 0.3% to 8% of operations. Patients and Methods: We performed a cross-sectional study between July and August of 2017 in Jeddah, Saudi Arabia. We used a 26-item, Arabic, electronically distributed questionnaire, to examine public awareness of the acute complications of bariatric surgery. Hypothesis testing was used to examine associations. Results: In total, 624 questionnaires were completed electronically. Mean age of participants was 25 (±13.2) and 66% were females. Of the surveyed population, 64% reported being aware of acute complications of bariatric surgery. Participants who had previously undergone a bariatric operation had a higher degree of awareness when compared to those who had not undergone a bariatric operation before (80.4% vs. 61.3%, P < 0.001). Females had higher awareness compared to males (70.8% vs. 52.1%, P < 0.001). Awareness of complications was not statistically different when stratified by level of education (P = 0.131) but occupation predicted awareness (P = 0.007). Conclusion: Two-thirds of the general population appears to be aware of the potential acute complications associated with bariatric surgery. Furthermore, awareness seems to be higher in females, individuals who had previously undergone weight reduction surgery, and health care workers. Background/Aims: Biliary atresia (BA) is a cholangio-destructive disease of the infant liver presenting with features of obstructive cholangiopathy. The Kasai portoenterostomy (KPE) is the first line of management. The aim of our study was to identify the characteristic features of liver histology in BA that impact the outcome of KPE. Patients and Methods: Data from 30 consecutive children was retrieved from our prospectively maintained database of children undergoing KPE. This included basic demographics, laboratory values and histopathological data from liver biopsy. The stages of fibrosis, presence of ductal plate malformation (DPM), giant cell transformation, extramedullary hematopoiesis and area percentage of α-SMA (α-smooth muscle actin) expression was correlated with jaundice clearance after KPE using standard statistical tests. Native liver survival was computed. Results: Overall, 13 (43%) children cleared jaundice in this series and 10 (33%) are alive with native liver. Lower area percent expression of α-SMA correlated with increased probability of jaundice clearance after KPE (P < 0.001). There was no correlation between stage of fibrosis and jaundice clearance (P = 0.52). DPM, giant cell transformation and extramedullary hematopoiesis did not correlate with outcome. All children who are alive with native liver had lower expression of α-SMA. Conclusion: α-SMA expression may be a potential predictor of jaundice clearance and native liver survival after KPE. 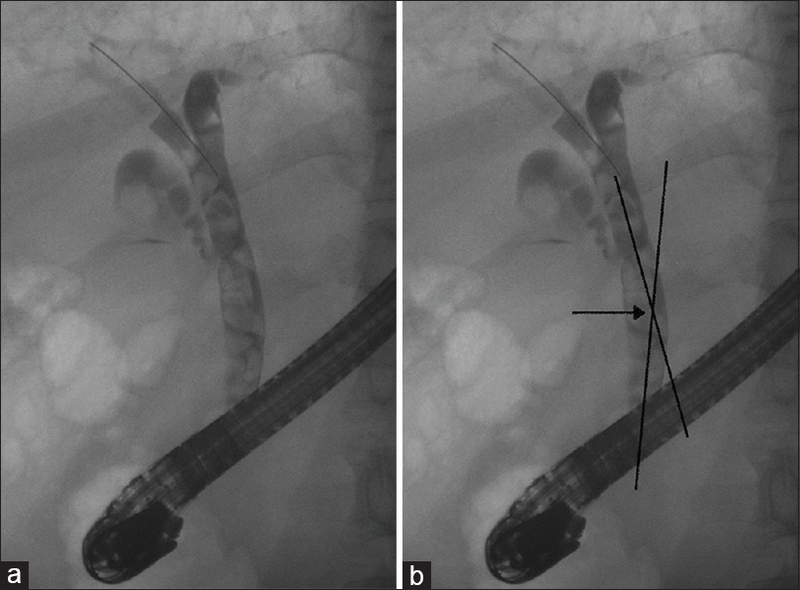 Background/Aims: Endoscopic sphincterotomy (EST) and endoscopic papillary balloon dilatation (EPBD) are used for therapeutic endoscopic retrograde cholangiopancreatography (ERCP). The postprocedure bleeding rate for EPBD is low in the normal population; however, this bleeding rate in a group of patients prone to bleeding, such as patients with end-stage renal disease, is not well-established. We therefore evaluated the post-EST and post-EPBD bleeding rate among hemodialysis (HD) patients based on data from Taiwan's National Health Insurance Research Database (NHIRD). Patients and Methods: The NHIRD entries for a population of 2 million were screened for patients who had a catastrophic illness card for HD between 1st January 2004 and 31st December 2011 and these patients were enrolled as research subjects. 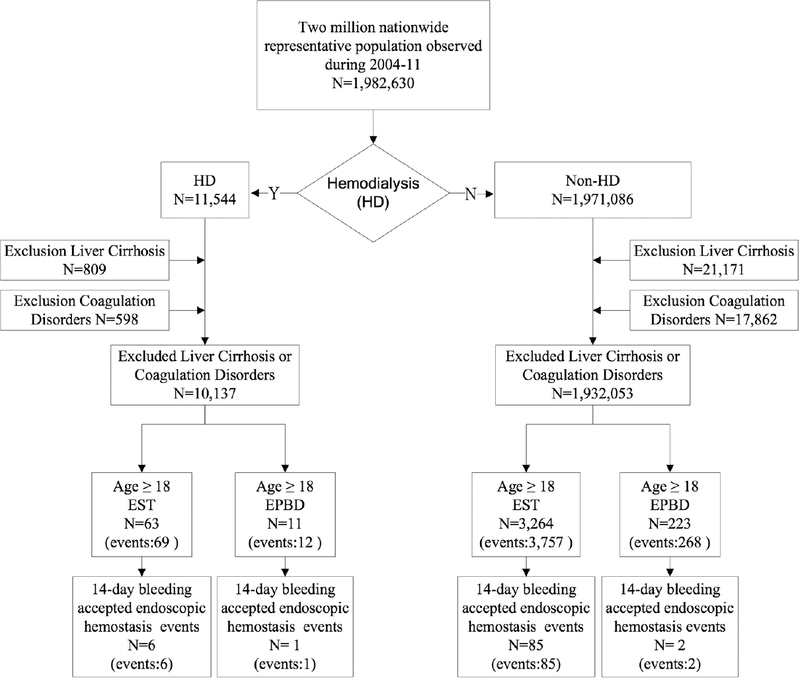 The rates of major gastrointestinal tract bleeding events appearing within 14 days after EST or EPBD were compared between HD and non-HD patients. Results: A total of 3561 patients, over 18 years of age and without liver cirrhosis or hematologic diseases, underwent 3826 EST and 280 EPBD procedures during the 8 calendar years selected for our analysis. The total post-ERCP major bleeding rate was much higher in HD than in non-HD patients (8.64% vs. 2.16%, P < 0.0001). The rate of postprocedure major bleeding events was lower for non-HD patients who underwent EPBD than those who underwent EST (0.75% vs. 2.26%; P = 0.049), whereas the postprocedure major bleeding event rates were similar in HD patients who underwent either EPBD or EST (8.70% vs. 8.33%; P = 0.484). Conclusion: Post-ERCP, post-EST, and post-EPBD major bleeding rates were all higher in HD patients in this study. EPBD resulted in lower postprocedure major bleeding events than EST in the non-HD population, but it failed to provide the reduction in bleeding events needed to perform endoscopic hemostasis in HD patients. Background/Aim: The dramatic color change after iodine staining (from white-yellow to pink after 2–3 min), designated as the “pink-color sign” (PCS), is indicative of esophageal high-grade intraepithelial neoplasia (HGIN) or an invasive lesion. However, no study has yet examined the association between the time of PCS appearance and histopathology. We investigated the association between the time of PCS appearance and esophageal histopathology in 456 lesions of 438 patients who were examined for suspected esophageal cancer. 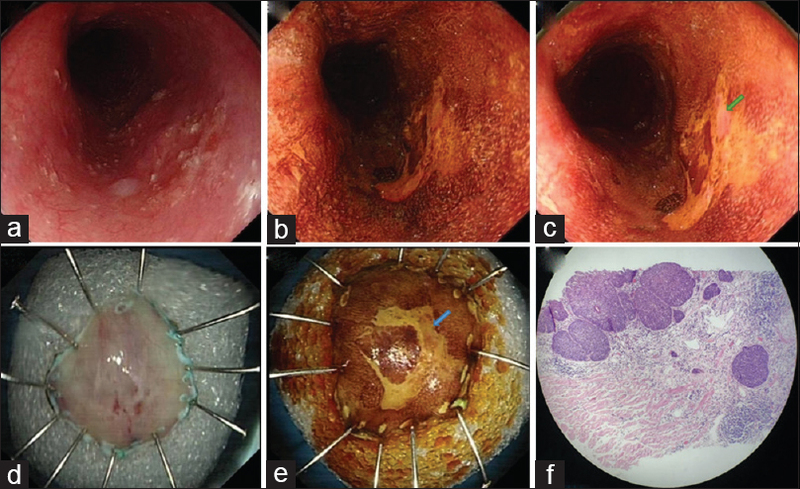 Materials and Methods: The records of 495 consecutive patients who had suspected esophageal cancer based on gastroscopy and who underwent Lugol's chromoendoscopy from January 2015 to March 2018 were retrospectively reviewed. The time of PCS appearance was recorded in all patients, and tissue specimens were examined. Results: We examined 456 lesions in 438 patients. Use of PCS positivity at 2 min for the diagnosis of HGIN/invasive cancer had a sensitivity of 84.1%, a specificity of 72.7%, and an accuracy of 80.4%. We classified the PCS-positive patients in whom the time of PCS appearance was recorded (168 lesions) into 4 groups: 0–30, 31–60, 61–90, and 91–120 s. Based on a 60-s time for appearance of the PCS, the area under the receiver operating characteristic curve was 0.897, indicating good validity. At the optimal cutoff value of 60 s, the sensitivity was 90.2% and the specificity was 82.3%. The appearance of the PCS within 60 s had a diagnostic accordance rate of 88.6%, significantly higher than appearance of the PCS within 2 min (79.7%, P < 0.05). Conclusion: Appearance of the PCS within 1 min after iodine staining has a higher diagnostic accordance rate for esophageal HGIN/invasive cancer than appearance of the PCS at 2 min. Background/Aims: This study aimed to explore the effect of circular RNA ARHGAP26 (circ-ARHGAP26) on cell proliferation and apoptosis in gastric cancer (GC) cell lines. Materials and Methods: Human GC cell lines including HGC-27, AGS, SGC-7901, BGC-823, NCI-N87 and human normal gastric mucosal cells GSE-1 were cultured. The circ-ARHGAP26 expression was determined by quantitative polymerase chain reaction assay. Blank inhibitor and circ-ARHGAP26 inhibitor plasmids were transfected into HGC-27 or AGS cells as NC (-) and circ-ARHGAP26(-) groups. Counting Kit-8 (CCK-8) and Annexin V (AV)/propidium iodide (PI) were conducted to evaluate cell proliferation and cell apoptosis, respectively. Western blot was performed to determine the expressions of apoptotic markers (C-Caspase3 and Bcl-2). 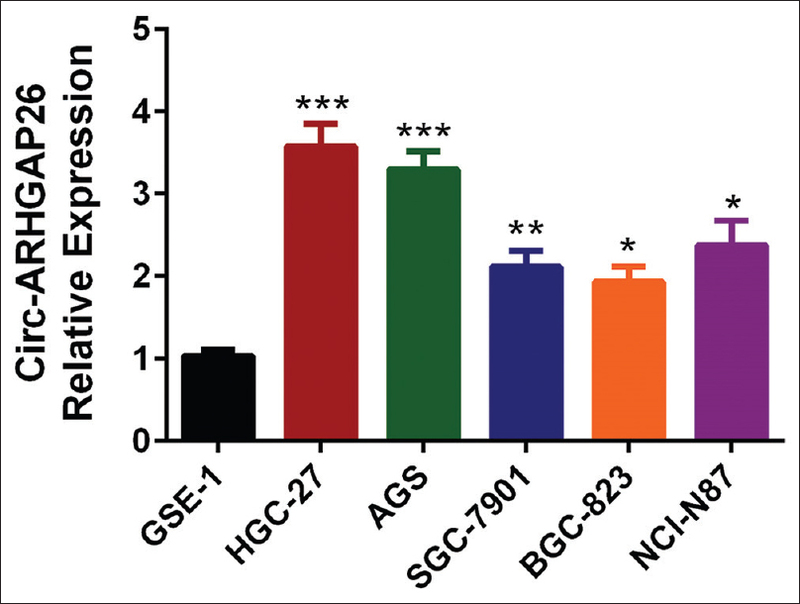 Results: The circ-ARHGAP26 expression was elevated in HGC-27 (P < 0.001), AGS (P < 0.001), SGC-7901 (P < 0.01), BGC-823 (P < 0.05) and NCI-N87 (P < 0.05) GC cell lines compared to GSE-1 cells. In HGC-27 cells, CCK8 assay revealed that cell proliferation was decreased at 48 h (P < 0.05) and 72 h (P < 0.01), while AV/PI assay disclosed that cell apoptosis rate was increased at 72 h in circ-ARHGAP26 (-) group compared to NC (-) group (P < 0.01). Western blot assay also illuminated that apoptotic marker C-Caspase 3 was raised, while anti-apoptotic marker Bcl-2 was reduced at 72 h in circ-ARHGAP26 (-) group compared to NC (-) group. In addition, further validation in AGS cells also exhibited that cells proliferation was repressed, while apoptosis was enhanced in circ-ARHGAP26 (-) group compared to NC (-) group. Conclusion: The circ-ARHGAP26 is over-expressed and its downregulation inhibits cell proliferation and promotes cells apoptosis in GC cells. Background/Aims: The aim of this study is to predict cases where the clearance of the biliary system from stones at the initial endoscopic retrograde cholangiopancreatography (ERCP) might be of value for better risk-stratifying patients. We attempted to identify factors that are associated with a higher failure rate of clearing the biliary system on the index ERCP. Patients and Methods: This is a retrospective study from January 2008 to January 2015. All patients with bile duct stones confirmed on ERCP were included in this study. Patients who had prior attempts of bile duct stone extraction were excluded. Results: A total of 554 ERCPs were performed to extract biliary duct stones from 426 patients. The mean age was 46.3 years and 41.7% were males. The group where the index ERCP did not clear the biliary system tended to be older (50.4 vs. 45.2 years, P = 0.03). On multivariate analysis, the presence of fever (OR 4.64; 95% CI, 1.66–12.79), a larger number of filling defects (OR 1.34; 95% CI, 1.13–1.93), presence of a stricture distal to a stone (OR 4.63; 95% CI, 1.36–15.78), the use of an extraction basket (OR 3.23; 95% CI, 1.56–6.74), and/or mechanical lithotripsy (OR 3.05; 95% CI, 1.10–8.49) were all associated with a lower odds of clearing the biliary system. The use of an extraction balloon was associated with the success of clearing the biliary system (99.7% vs. 77.4%, P < 0.01) and a lower odds of failing (OR 0.01; 95% CI, 0.00–0.08) on multivariate analysis. Conclusion: A few of the characteristics that are found on cholangiography at the index ERCP could be used to identify patients that might require more than one ERCP to clear the biliary system from stones.